Nine cyclists from Conlon successfully completed the “Way of the Roses” in just three days, raising money for the Rosemere Cancer Foundation. 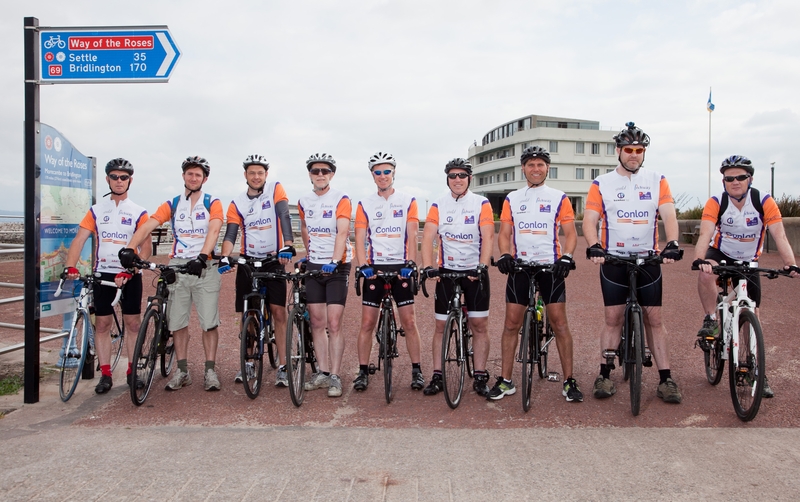 The riders began the gruelling, coast-to-coast, 170-mile bike ride on 19th June, passing through both Lancashire and Yorkshire, ending in Bridlington. Reality kicked in on the first day, climbing High Hill in Settle, this was tough for experienced cyclists so it was an achievement in itself just to get through Day One! The morning of Day Two was also difficult as the climbing started immediately. Once we reached Ripon at lunch time of Day Two we knew the hardest work was over and the cycle from Ripon to York was actually enjoyable. A good (team-bonding) night out in York set us up nicely for the final 63 miles to Bridlington on Day Three. Turning the corner and seeing the sea front was an amazing feeling and the journey was thoroughly enjoyable for all, with a great sense of achievement knowing that we had raised a lot of money for a very worthy charity.